Formerly know as Universal Acrylic Polymer. 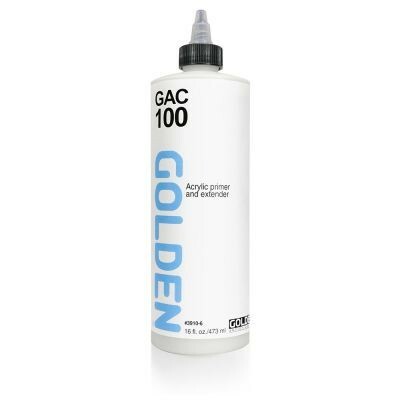 GAC 100 Multi-Purpose Acrylic Polymer is a sealer that helps prevent Support Induced Discoloration (SID) caused by impurities that are drawn up through a substrate as the acrylic paint dries. GAC 100 is also useful for diluting and extending colours, increasing flexibility and film integrity, sizing for fabric and sealing for wood. GAC 100 will wet out solids, including pigments, more readily than other polymers and is useful for artists formulating their own paints. GAC (short for Golden Artist Colours) Specialty Acrylic Polymers are based on 100% acrylic polymer emulsions. The GACs are useful as mediums or modifiers of acrylic paints. GACs can be used to extend acrylic colours, to regulate transparency, create glazes, increase gloss, reduce viscosity or improve adhesion and film integrity. GAC polymers can also be used for binding pigment solids for various effects and surfaces. Unlike the other GOLDEN Mediums and Gels, GAC Acrylic Polymers have only a minimum amount of thickeners, levellers, defoamers and surfactants to ensure good film formation.